“We were so pleased with the quality of the customized training, the planning and the follow-up that we received that we have contracted again with PMC Training to host another two group learning events in the spring of 2016. I am also looking to expand the learning for the same supervisors/managers by considering a two-day workshop on Managing for Superior Results Level II: From Manager to Leader”. Beverley Banks, Manager of Human Resources, MacEwen Petroleum Inc. 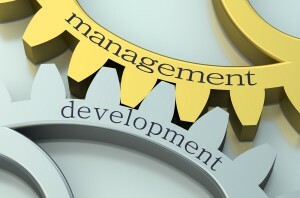 Customized Management Skills Development Program: MacEwen Petroleum Inc.
MacEwen Petroleum Inc. is a Canadian owned and operated fuel provider and convenience store operator. The company has built and sustained customer relationships in Ontario and Quebec for 40 years. MacEwen has grown by 40% in recent years. Many supervisors and managers have joined the company, or have been promoted internally. This growth presented MacEwen with an opportunity to develop new standards and a consistent approach to staff management. In 2015, MacEwen used a Canada-Ontario Job Grant to fund a series of in-house management skills development training modules. MacEwen looked for a partner to design and deliver training to all supervisors and managers at all levels of seniority and experience. Off-the-shelf modules were not the best solution. The training had to be customized – structured so that each module would prepare the learner for the next. PMC Training was identified as a potential partner on the recommendation of a colleague who had attended a PMC public workshop, Managing for Superior Results Level I: Fundamentals of Supervision. After reviewing the program outline, MacEwen sent three newly-minted supervisors to the next PMC public workshop. The three supervisors offered rave reviews about the facilitator’s skill in engaging the group, the content of the workshop and how the training changed the way they approached their work. They recommended that all supervisors and managers attend the program. Based on this recommendation, Beverley Banks, MacEwen’s Manager of Human Resources, contacted PMC Training’s Client Services Manager to explore opportunities to partner and provide customized in-house workshops for supervisors and managers. PMC developed a training proposal and MacEwen selected PMC as its training provider following a comprehensive needs assessment. PMC recommended that the MacEwen training begin with a one-day workshop, Leading Yourself – Building Strengths and Relationships Through Self-Awareness. The DiSC personality assessment was used to help workshop participants understand their own behavioral styles. It also helped participants build more effective working relationships through clearer understanding of others’ behaviour patterns and learning styles. This assessment process built stronger relationships between workshop participants, and created expectations for the broader skills development program. Participants ranked the facilitator highly for meeting workshop objectives, understanding the subject matter, pacing, answering questions clearly, reinforcing concepts with exercises, engaging the group, and relating learning to work. The insights provided by the DiSC personality assessment and the group debriefing. Training content completely tailored to and integrated with the MacEwen context. A diverse and well-chosen range of activities and exercises. This training brought individuals and teams together. Participants who worked at separate locations could now put faces to names. Contacts were made and support networks formed. Participants learned about each other’s areas of the business, creating a more connected and productive workforce and strengthening the MacEwen brand. The effect of the training on the company and its people has been remarkable. After only one year, turnover rates have fallen, and management has measured employee engagement, and near-engagement, at 85.7%. MacEwen’s supervisors and managers have been honing and applying their newly acquired skills since the training. PMC facilitated a 90-minute follow-up workshop to reinforce learning and knowledge transfer. Participants shared the positive impact they were having in the workplace, and they had an opportunity to discuss any challenges they’ve experienced since the program. Participants explored the core modules they found most useful — especially situational leadership, leader values, discussing management challenges, performance feedback and active listening — and created a plan to support the application of newly acquired skills. Participants gained an understanding of the importance of employee engagement, and an appreciation of the benefits it brings to their teams. MacEwen’s first employee engagement survey measured several indicators against benchmarks and found a strengthened company culture and identification, with improved pride, commitment, team spirit, job satisfaction and work relationships. The performance reviews that were conducted and completed in the fall of 2015 were the most content-rich and focused that Banks had seen in six years of performance evaluation. Banks believes the supervisory skills training, and the introduction of SMART goals made a particularly important contribution to these changes. Additional workshops are planned for 2016. At that time a follow-up case study may take a longitudinal look at the impact of the PMC workshops on MacEwen’s business.